For many years, Mandlenkosi and his wife Noxolo had a burden for the children in the impoverished community of Msobomvu, Transkei. It lies in the shadow of the industrial city of Butterworth. The children of Msobomvu live in shacks, garbage dumps and in the bushes. As a result of years of prayer, the Lord gave this couple a vision for a center where children can come and find safety and life. Because the mission initially didn’t have the resources to fulfill the vision, the mission continued in prayer for many years. 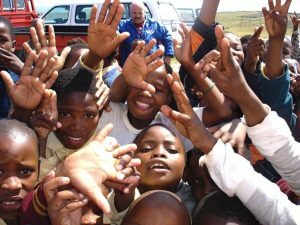 In 2006 the Lord sent Polly Purcilfull from America to the Transkei with the same vision, for a children’s center. In answer to their united prayers, the Lord had provided the resources to develop the children’s center. The mission finally opened the Grace Children’s Shelter (GCS) in 2008. Prior to it’s opening GCS had to decide if the children’s center would focus on quantity (reaching as many as possible), or alternatively, GCS could focus on quality (giving these children quality care). 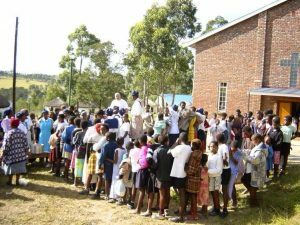 After much prayer, the leaders decided on providing a quality children’s center that would provide healthy meals; teach hygiene, language, and primary education; and most of all share the Gospel of Christ. In spite of limited resources, the GCS has continually grown. It is now an example of a children’s center that others attempt to emulate. GCS is a registered NGO and operates as a non-profit entity. Although Kelly was instrumental in getting it established, it is under the direct supervision of Mandlenkosi.